Indu Ayappa, Ph.D.; Robert G. Norman, Ph.D.; Vijay Seelall, M.D. ; David M. Rapoport, M.D. 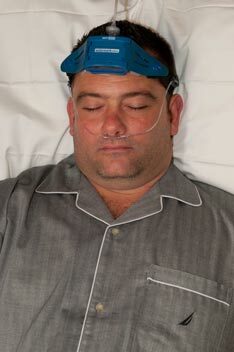 Study Objectives: To evaluate the validity of the Apnea Risk Evaluation System (ARES™ ) Unicorder, a self-applied, limited-channel portable monitoring device for the evaluation of sleep disordered breathing (SDB). Design: Prospective study with blinded analysis. Setting: Sleep disorder center, academic institution. Participants: Eighty patients with suspected obstructive sleep apnea hypopnea syndrome (OSAHS) and 22 volunteers. Measurements and Results: Subjects used the ARES™ Unicorder at home for 2 nights using only written instructions. Within 2 weeks, they returned to the laboratory for full nocturnal polysomnography (NPSG) with simultaneous monitoring with the Unicorder. NPSGs were scored manually to obtain an apnea-hypopnea index based on Medicare guidelines (AHI4%) and a respiratory disturbance index (RDI). ARES™ studies were autoscored and reviewed to obtain indices based on equivalent definitions i.e., AHI4% ARES and apnea hypopnea (events with 1% desaturation) index (AHI1%ARES ). Indices from the NPSG were compared to the in-lab ARES™ and in-home ARES™ indices using mean differences and the intraclass correlations (ICC). For the in-lab comparison, there was high concordance between AHI4%NPSG and AHI4%ARES (ICC = 0.96, mean difference = 0.5/hour) and RDINPSG and AHI1%ARES (ICC = 0.93, mean difference = 3.2/hour). For NPSG versus In-Home ARES™ comparison, there was good concordance between AHI4%NPSG and AHI4%ARES (ICC = 0.8, mean difference = 4.1/ hour) and RDINPSG and AHI1%ARES (ICC = 0.8 mean difference = 8.6/ hour). The diagnostic sensitivity of in-lab ARES™ for diagnosing SDB using an RDI cut-­off of 15 per hour was 95% and specificity was 94%, with a positive likelihood ratio (LR+) = 17.04, and negative likelihood ratio (LR-) = 0.06. For in-home ARES™ data the sensitivity was 85% and specificity 91% (LR+ = 9.34, LR-­ = 0.17). There was good agreement between the manually scored NPSG SDB indices and the autoscoring ARES™ algorithm. Conclusions: ARES™ Unicorder provides acceptably accurate estimates of SDB indices compared to conventional laboratory NPSG for both the simultaneous and in-home ARES™ data. The high sensitivity, specificity, and positive and negative likelihood ratios obtained in the group we studied supports the utility of an ambulatory limited-monitoring approach not only for diagnosing sleep disordered breathing but also to rule out SDB in suitably selected groups. Citation: Ayappa I; Norman RG; Seelall V; Rapoport DM. 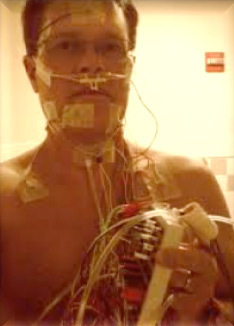 Validation of a self-applied unattended monitor for sleep disordered breathing. J Clin Sleep Med 2008;4(1):26-37.